We live in a culture that is obsessed with beauty. Our society is more commercialized then ever and with this there has been a backlash whereby many people believe that children are ‘growing up too fast’. With a constant debate about the sexualisation of children is it appropriate to let young girls wear make-up? Celebrities have been criticised for letting their children wear make-up, for example when Katie Price posted a picture of her daughter Princess (age 2) wearing false eyelashes it caused a media outrage. Similarly Katie Holmes has been condemned for letting her daughter Suri wear dark red lipstick at the age of five. Celebrity psychologist Dr Linda Papadopolous was quoted in The Sun newspaper saying that young girls putting on make-up can be potentially dangerous and she believes that girls like Suri and Princess Tiaamii deserve more than to be adultified at such young age – there are other ways to be cute. I remember being young and wanting to dive into my mums make-up bag whenever I could. My Christmas list would always consist of a vanity case which was full to the brim of all different colours of eyeshadows, lipsticks and nail varnish’s which I desperately wanted. Children are in awe of their mothers, and their earliest role model is their mothers, so of course they are going to want to do what their mum is doing. 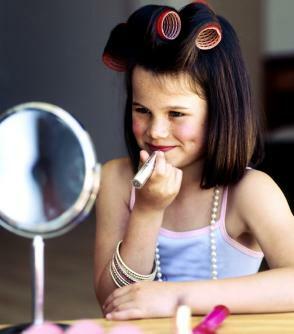 That dressing room moment when you see your mum putting on make-up in the morning or before her night out, makes any young girl want to join in the fun and apply make-up. My mum let me play with make-up from a young age when I was at home, but much to my dismay I was never allowed to leave the house with it on. I was taught that make-up was a privilege for when you are older, but it was ok to play with when you were young. Make-up is everywhere and it cannot be avoided, young girls pick up on this and want to experiment. You just have to go into Toys R Us and there is a section dedicated to make-up for children. I was very surprised when I stumbled across a You Tube make-up tutorial by a 6 year old girl reviewing childrens make-up sets, she has done several videos and some have nearly reached a million views. You just have to search on YouTube and hundreds of videos of young girls giving make-up tutorials comes up. Is this a step to far? Should young girls applying make-up be available for the whole world to see? The campaign group Pinkstinks, which challenges the culture of pink for girls, firmly believe that children should not be exposed to make-up. Their current campaign called “Slap – on the face of childhood” focuses on the steady proliferation of make-up aimed at little girls and the damage that this normalising of make-up can do to the self-esteem of young children. They believe that making children internalise messages about beauty products at this crucial and early stage of development, is nothing more than corporate conditioning. Slap wants retailers to take corporate and social responsibility and asks parents to consider the impact that beauty products have on their young children. So if make-up on young children isn’t acceptable when is it ok for them to start wearing make-up? There was always a constant battle between pupils and teachers at my secondary school about wearing make-up. You were not supposed to wear make-up until you were in year 10 (age 15/16). However we would all wear it anyway just not too obvious, or else you would be sent to one of the senior teachers who would make you scrub it off! Generally it is socially acceptable for girls to wear make-up when they hit puberty as their peers begin to wear it. The topic of make-up and children is always going to be a controversial one, which people will have very different opinions on. I personally think parents and companies need to be careful not to blur the boundaries of when a child becomes an adult, but surely harmless fun playing with make-up is ok?